After leaving Panama City I made reservations at a city park at what I thought was just north of Mobile, AL. Turns out, River Delta Marina and Campground was about 45 minutes to Mobile which was just too far for all the things we wanted to do while we were there. However, the price was great. For just $20/night we had full-hookups and only 3 neighbors across the park. We were close to the bath house and the playground. It was actually a really great park. There was a nature trail along the lake that was beautiful. I even found this really cute old man contimplating life out there. Since we had friends to visit and things we wanted to do in town, we decided to move to a state park that was a little closer to the action. 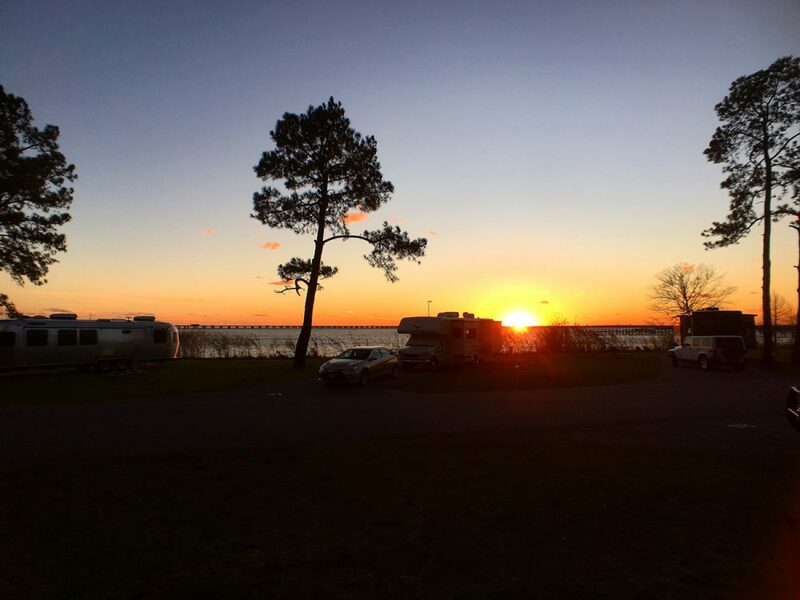 We left the city park after a few days and headed to Meaher State Park in Spanish Fort, AL. I was so nervous about being there after reading some reviews online about how bad the ants were. We did see a lot of ants on the ground around our RV, but thankfully only a few made it inside. There was a review about a guy having to encapsulate his entire RV because the ants had over taken it and his truck. Crazy! We also have friends who went there in the summer last year and got ants in the RV really bad. I don’t suggest this park in the summer. Luckily it was cool enough that they weren’t as bad as they usually are. Shew. I just don’t do bugs. I’m trying to relax about it but bugs in the house really stress me out! While in Mobile, we attended our first ever Mardi Gras Parade! We went to a noon parade and we were told that it was very tame and family friendly. I would agree with that except for the music that was blaring at one street corner. They had a DJ playing some songs that were not what I wanted my kids to hear but we just walked further down the street to where we couldn’t hear it as much. Luckily they are still young enough that they don’t really listen to the words of most songs. We couldn’t believe how many beads and moon pies and random things they were throwing at us! We left with 113 strands of beads and handed off most of the other items to the folks next to us. I have no use for plastic cups, raggedy stuffed animals, and candy in weird packaging. The kids were so excited about how many beads they got. They played with them for several days and when they were tired of stepping on them in their room they all suggested we get rid of them! I happily obliged! After the parade we went to the Immaculate Conception Church that was just across the street from where we parked. It was, in deed, immaculate. Huge windows of stained glass. The detail on the ceiling was just beyond impressive. Statues all over the place. Then we spotted the pipe organ! I have never seen an organ with that many pipes! I wish we would have been there Sunday to hear it. I bet it sounds amazing in that room. We all had a blast at our first Mardi Gras Parade and we agree that it is a family friendly event in Mobile, AL. We had been dealing with our refrigerator not working right for about a month before we got to Mobile. It quit working one day and we thought we had got it fixed but then it stopped again the next morning. Thankfully we were able to get it to run on propane for a few weeks before it quit all together. Jonathan had done some research and believed it was the heating element that went bad (which is what we told the first guys who worked on it) and he was right! The folks at RV Collision Repair in Mobile fixed it up for us and we were on our way! Finally, I can go to the grocery and buy meat and know it won’t go bad in the middle of the night! It’s the little things that make me happy, like refrigeration! Our friends, @takethatexit, joined us for a couple days at Meaher State Park. They got a sweet spot right on the water for their awesome Airstream (I’m trying so hard to not be jealous of their Airstream). We made plans to go tour the USS Alabama together. We have met us several times since our first meet up in the Keys. Their kids get along so well with ours and we love spending time with Heather and Jeremy. They're such a fun family. If you’re in Spanish Fort, I highly suggest you take a tour of the USS Alabama. It was really cool. So huge, so much history, so many things to see. The museum also has a submarine that you can tour. It takes tiny living to a whole new level. I don’t have any desire to live on a submarine but gained a lot of respect for those who do. They also have a bunch of fighter planes in a huge building that you can go look at. It was really impressive. We loved our time there and we loved that we had friends to go with us. We also LOVED that they had a press penny machine! We look for them everywhere we go. Jonathan has a friend in Mobile and we were excited to meet up with his family while we were in town. They fed us delicious tacos and guacamole and let the kids destroy their playroom with legos. They even gave us their last Guaranã. I tried not to cry about the delicious Brazilian soda for fear that they would think I’m a complete moron. How embarrassing if they remember me as ‘Jonathan’s crazy wife who cried over a soda’. It’s really sad how emotional I get about food and I’m not so sure it’s healthy. I’m working on that! We had a great time meeting up with the Neto’s and I’m so thankful for friends we meet up with along the way. People who offer us meals in their homes and take the time to entertain our kids are such a blessing to us. We also got to meet up with another family in Mobile who will soon be a fulltime RVing family. They just purchased their own travel trailer and will soon be having baby number 6 and transitioning into full time RV life! They introduced us and the @takethatexit crew to our first ever Crawfish and Royal Reds Shrimp - Cajun Style! I just couldn't eat the crawfish, looked too weird and so much work for such little meat. We did enjoy the Royal Reds though. Thanks for showing us how it's done Long family! We had made plans with Jonathan’s parents to come down to Spanish Fort and spend the weekend with us before we head out west! It was our closest stop to them and they were excited to come see the kids! We were SO excited when the finally drove up that Friday afternoon! We had all of Friday, Saturday and Sunday, and Monday morning to spend with them! We went across the street to Five Rivers Delta Resource Center and looked around at all their buildings full of displays and information about the area. It was all free and the kids loved seeing all the live snakes, the baby alligator, birds, and turtles and more. They loved all the huge taxidermy animals they had out too. There was a lot to look at and then we found out that they had a boat tour. Jonathan’s parents treated us to the boat tour and it was pretty fun. I think it would have been better if it had been warmer and more animals were out. We mostly just saw birds and they gave us information about the delta. It was very informative, but we didn’t appreciate the language that the tour guide was using with our kids on board. I felt it was very inconsiderate due to our kids ages and not very professional. But if that doesn’t bother you then you will learn a lot on the boat tour. We also took a day to tour the small town of Fairhope, AL. Many people told us that we HAD to go to Fairhope and I’m so glad we did. What a cute little town. So many small shops and people out walking around. They had some ice cream at Mr. Gene’s Beans and Jonathan and I went across the street to Fairhope Soap Company. I ordered some shampoo and am still anxiously awaiting it to ship to me! We walked out to the pier and just enjoyed our time with Mimi and Papa. We went to Cafe Del Rio for dinner and soaked up as much family time as we could. It was so much fun having them stay with us in our home-on-wheels. They even brought us lots of bottles of our favorite drink from Knoxville, Cruze Farm’s Coffee Milk! Sunday was Valentine's Day and we had to run a few errands so Mimi and Papa made room in their van to take all 4 kids. They love riding in their van with them. When we were getting ready to head out I happend to look down at our tires and noticed a huge gash in our rear drivers side tire. We drove to Goodyear because it was close and open on a Sunday and we ended up purchasing a new tire for Valentine's Day. How romantic! We were sad to say ‘see you later’ Monday morning but tried our best to not have a repeat of us leaving Knoxville last October. (that was rough) We got in the truck and reminded the kids that when we arrived in New Orleans we would be getting beignets and that seemed to help them look forward to our trip! It’s always so hard to leave family behind but once we are on the road and exploring, it makes it easier for the kids. We make sure we FaceTime with family as often as time allows and we email and text so that everyone stays connected. Sometimes we wonder if being away from our extended family will have a negative effect on the kids later on. We do believe this is what we are supposed to be doing and that as long as the kids are enjoying our time and learning and experiencing new things that they will continue to have a healthy relationship with not only our extended family but with our friends we meet along our way. Most importantly, I want them to have a close relationship with each other. I was never really close to my sisters when we were all at home, and I don’t want that to happen to our kids. I want our family bond to be strong and to know that relationships really matter. Relationships within our family and with the friends we will meet along the way. We were called to love, not just our family but everyone we meet and sometimes it’s a hard concept to teach but we’re trying.